This 1990’s house was dramatically transformed into a modern contemporary home with all the latest designs and materials. 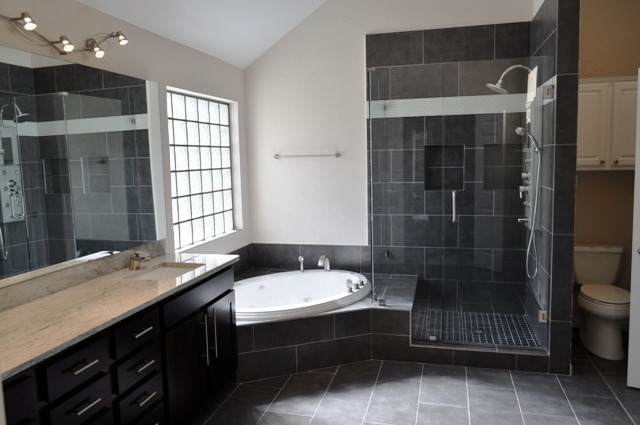 Starting here with the master bathroom, you can see the vivid changes from cultured white marble tub and vanities to dark ‘Anthracite’ porcelain tile and white glass accents. 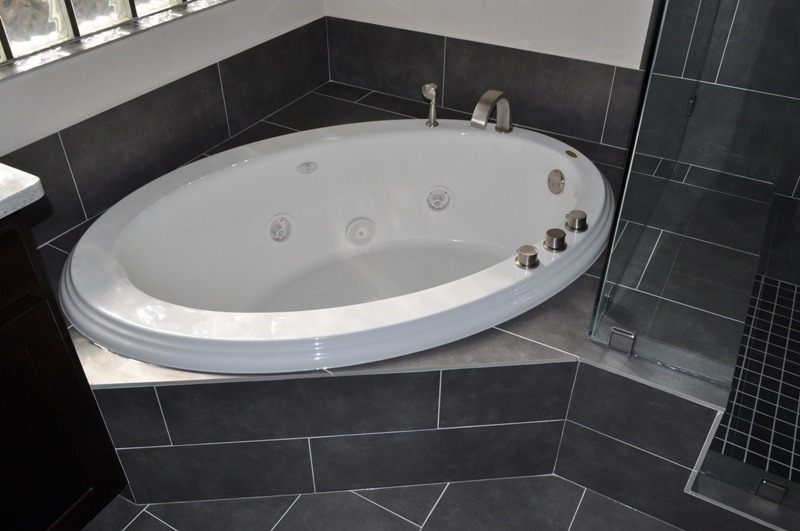 A new drop-in Jacuzzi tub with stainless Roman faucet, and a brushed stainless bodyshower system bring a high-tech feel to this bathroom. 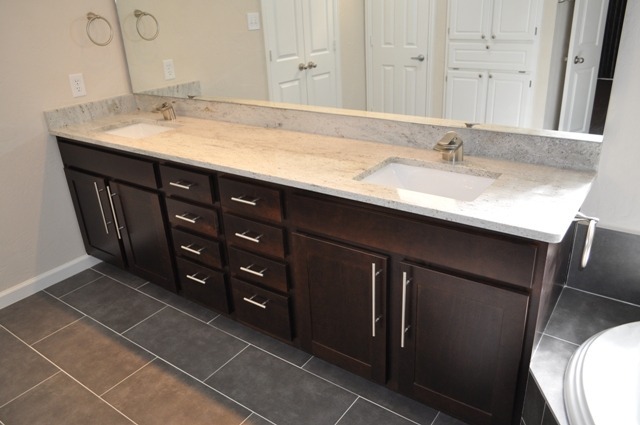 We replaced the existing vanities with new solid wood ‘Espresso’ cabinets and drawers with modern post-type nickel cabinet pulls. The counter is custom ‘White River’ 3cm granite with rectangular white porcelain sinks, and waterfall-type brushed nickel faucets. Interestingly, we retained the mirror, but mounted it 2″ proud of the wall, and installing concealed LED string lighting for a ‘glow’ effect. 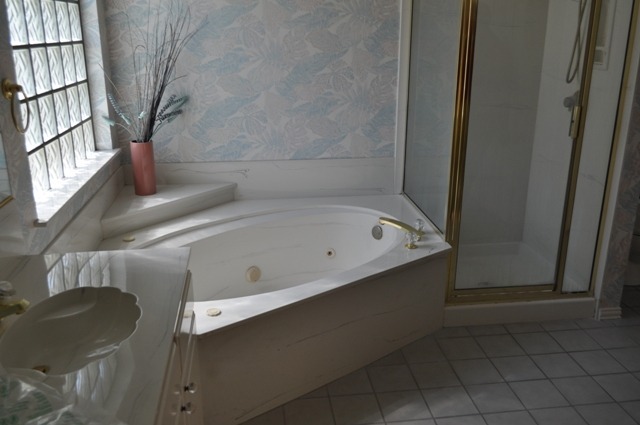 Here’s a close-up of the new Jacuzzi tub. 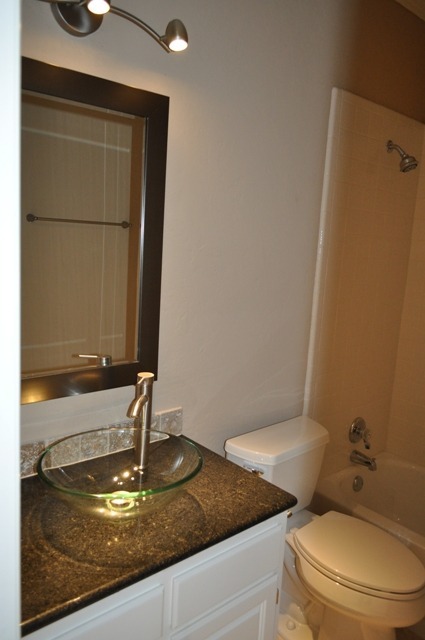 Note the stylish brushed nickel faucet with separate flexible handshower. 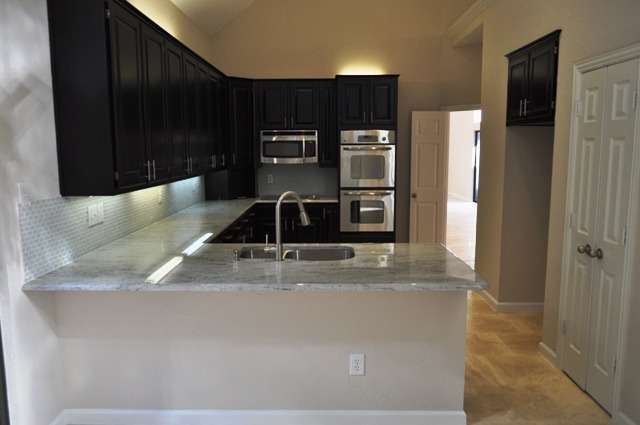 The kitchen, of course, morphed into an elegant high-end dream with restained cabinets, ‘White River’ custom granite counters and undermount sink, and especially the stunning frosted white glass subway tile backsplash. 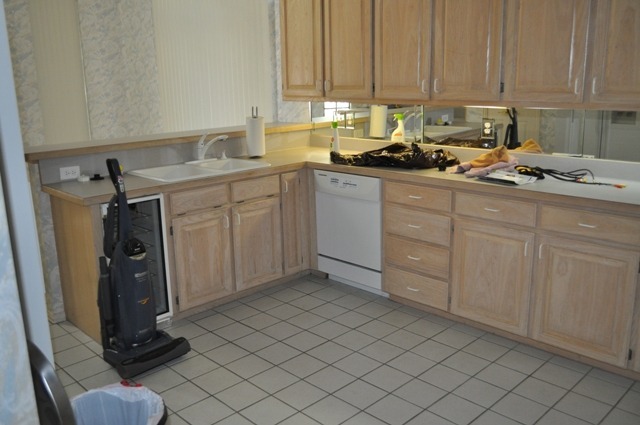 New stainless appliances abound, and a new travertine floor replaces the dated white ceramic tile. 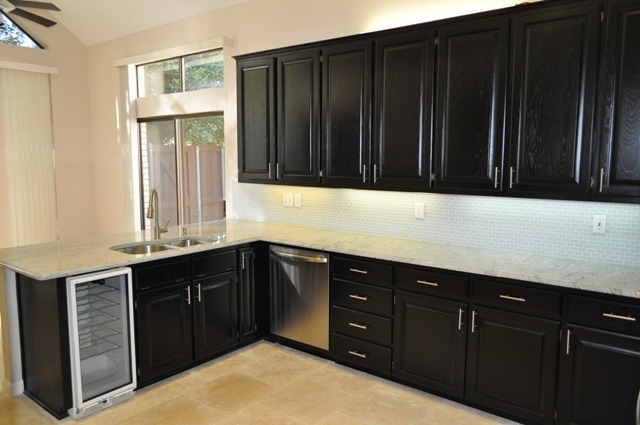 This view shows the restained cabinets in an ‘Ebony’ color with satin polyurethane finish. The quality rivals high-end furniture and you can clearly see the wood grain. 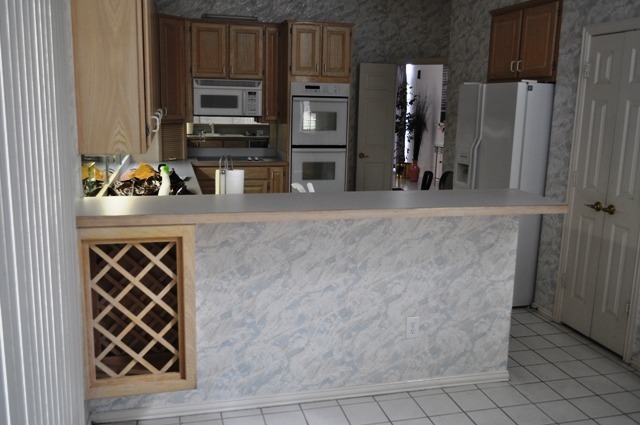 We retained the wine cooler but replaced the dishwasher with a new integrated stainless steel unit. 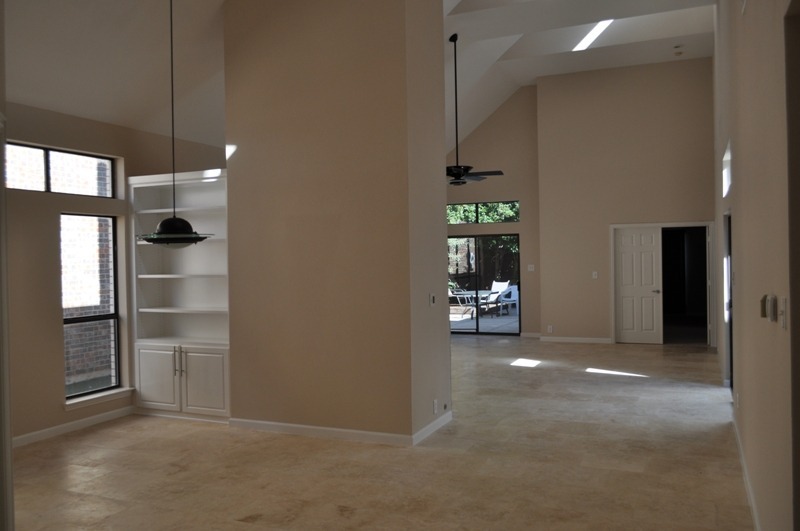 Moving into the den, we had to raise the original sunken floor by 4″ with reinforced concrete, which definitely took away the dated style. 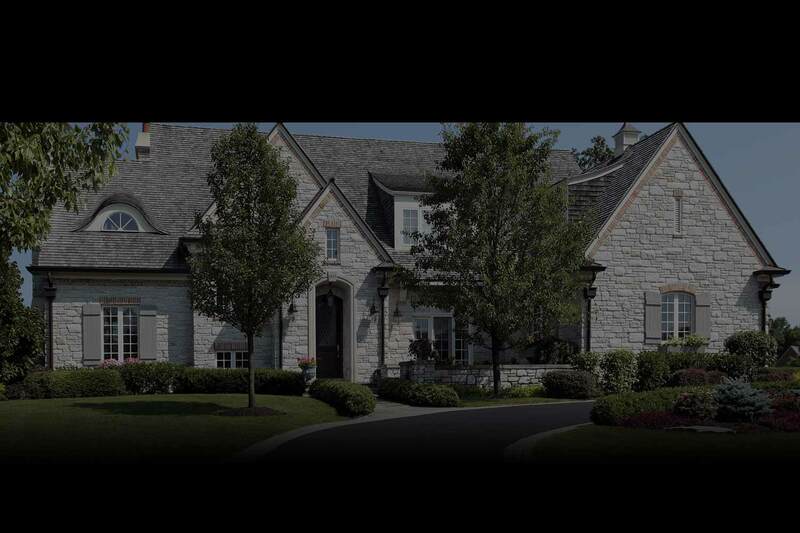 New 18×18 ‘Portofino’ travertine tile was laid throughout, and rough stone was laid on the fireplace mantle, replacing the black marble. New custom built-in bookshelves were added, and the old recessed ceiling lights were updated with 12W white LED floods, improving the general color feel. 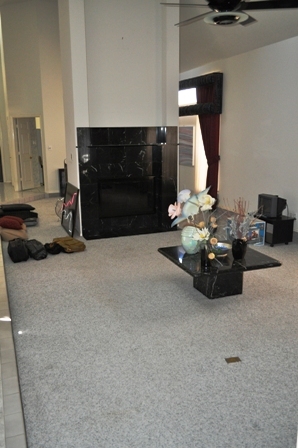 This shows the full view from the dining area through to the living area and master bedroom doors. 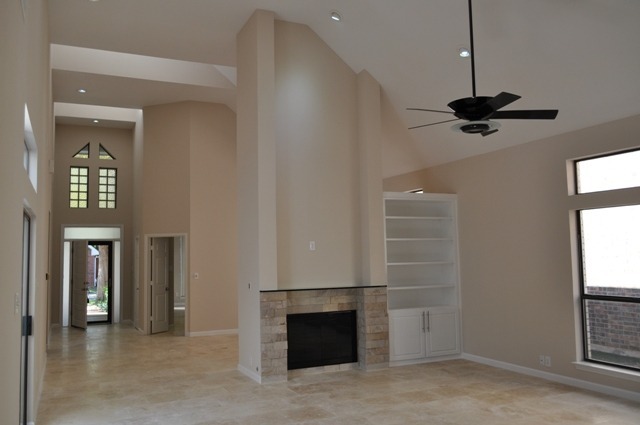 Note the new custom built-in shelves and the large expanse of new 18×18 travertine, with all new baseboards. 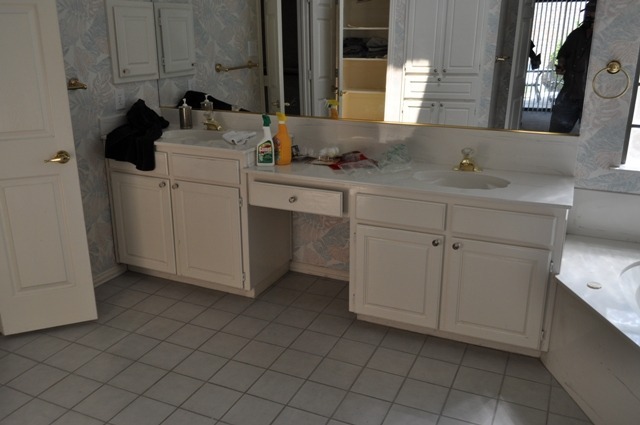 We also revamped the guest bathroom, removing wallpaper and retexturing, and updating the vanity with a new granite top and undermount sink. 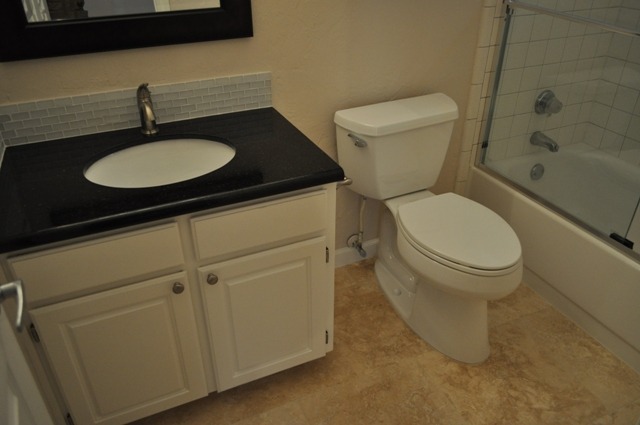 A new chair-height toilet was installed, and beautiful travertine floor complete this elegant makeover. 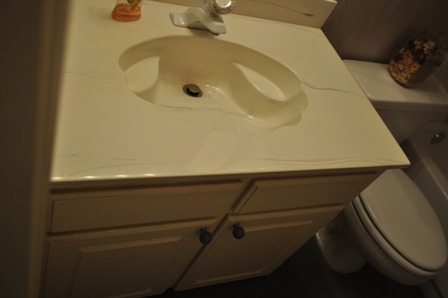 and finally, the powder room was updated with a new granite vanity top and glass vessel sink, with a simple tumbled marble backsplash. 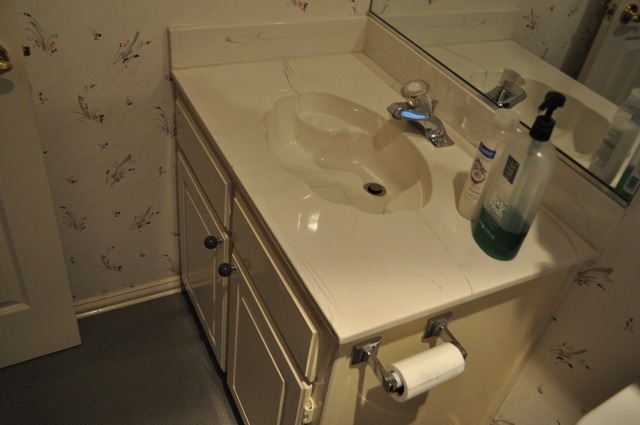 A new large framed mirror and LED vanity light was added, plus a new Kohler elongated toilet.